MileagePlus is the frequent flyer program run by Star Alliance member United Airlines. In this guide, we will take a look at the opportunities for Australian based frequent flyers (or anyone for that matter) when it comes to buying United miles. 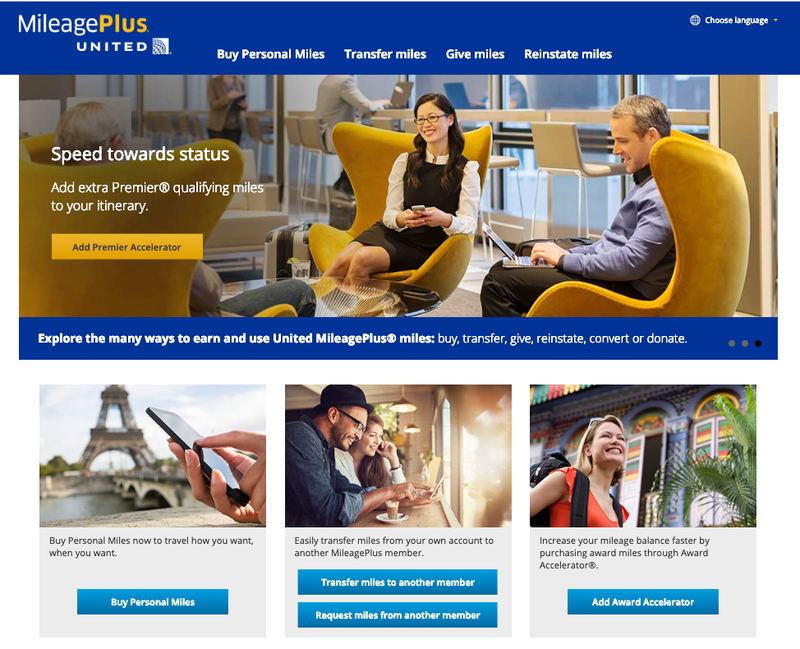 United Airlines, among many others, sells frequent flyer miles to its program MileagePlus. From time to time they even run a sale which presents an excellent opportunity for savvy travellers. 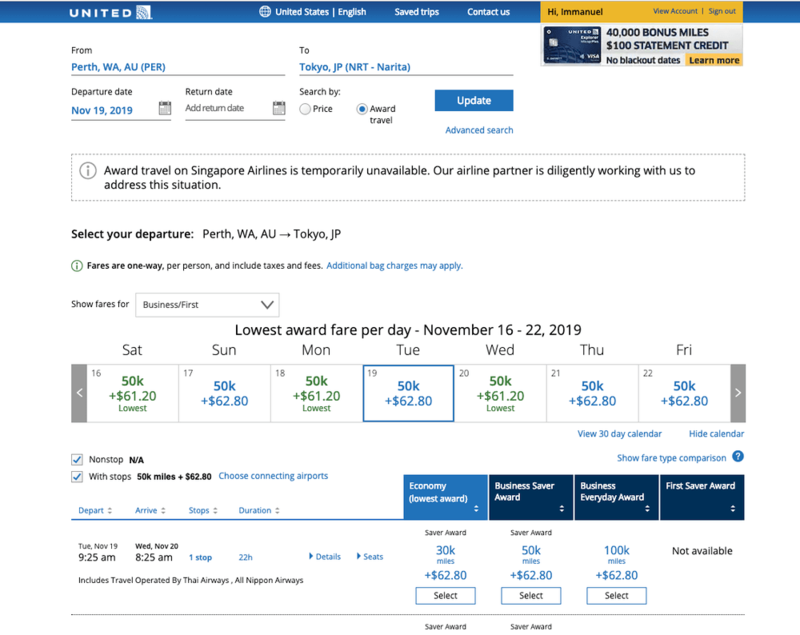 Here’s how: buy United miles during a sale and redeem them for business or first class flights on any (except Singapore Airlines for the time being) of the Star Alliance network partners (we’re NOT talking about upgrades but rather, outright redemptions). Essentially you’re buying premium class tickets at highly discounted prices by using your miles to book them. 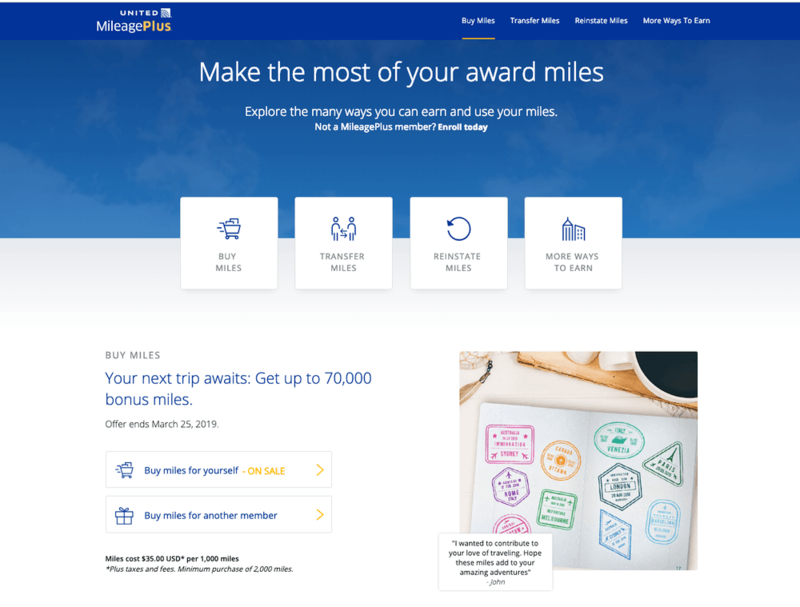 Right now you can buy miles for United with a 67% bonus until March 25, 2019. While we’ve seen better offers in the past, if you have a redemption in mind it can make sense to buy miles now. If you’re already a United Mileage Plus members, click here to see your bonus offer. If you’re yet to join the United Mileage Plus program, you can click this link to do so. Buying the maximum amount of 104,478 will result in a bonus of 67% which means you will walk away with a total of 174,478 miles at a cost of USD $3,930.98. This means you’re buying miles at 2.25 cents (approximately). United Airlines sell miles via this website (although it’s managed by points.com – who handle most of the airline’s mileage sales). When there’s no sale on, buying miles doesn’t make sense unless you’re just a few short. The minimum amount you can buy is 2,000 miles, and the annual limit is set at 175,000 miles which includes any bonuses. If you have a United account you’re eligible to purchase miles; there are no waiting periods like you encounter buying Alaska Airlines miles. However, bonus points can be targeted from time to time so when a sale is on, check if you’re eligible for a better offer here. United runs promos every 2-3 months, and the highest offer we’ve seen is 100% bonus miles. United Airlines has one of the best websites to search and book awards. Savvy frequent flyers often use the United Website when researching award space with other programs so booking an award flight is pretty straight forward. Since United is a Star Alliance member, you will be able to book flights on member airlines except for Singapore Airlines (for the time being). In addition to the Star Alliance partners, United also partners with Eurowings, Azul and Aer Lingus which might be handy for some. Keep in mind that not all routes offer great value so make sure you research the cost before buying any miles. United Airlines offers 2 types of outright redemption rates. What I mean by outright redemptions is that you don’t use points to upgrade but rather redeem a “free” (you still need to pay for taxes) flight using your miles. This is the ideal redemption level since it’s the lowest price you will pay by using your miles. Saver Awards are also harder to find since only a limited amount get released on each flight. These types of awards are a lot more expensive and might not make financial sense, especially when you’re using purchased miles. Personally, I would avoid them, but they are more readily available compared to Saver Awards. United Airline’s frequent flyer program is definitely one to keep in mind, especially when there’s a high bonus sale on offer. However, it’s always worth checking revenue airfare prices as sometimes it’s actually cheaper than buying miles. For example, you could buy a return first class ticket from Sydney to Bangkok with Thai Airways for $4708, the same ticket with purchased miles would cost you $4989 when you factor in the taxes and cost of buying United miles. If you’re flying from Australia’s East Coast, you can often find a reasonable price, especially to Japan. Considering retail airfares in business class usually go for around $7,000 return, by buying United miles you could score the same ticket for half the price or even less when there’s a 100% bonus sale on offer.